A family-owned farm just outside of Leesburg. Fall vegetables available now: butternut squash, acorn squash, cauliflower, cabbage, turnips, broccoli, and more. Pick-your-own pumpkins available through October! Their fall market has one of the largest selections of pumpkins and gourds around with over 50 varieties! They have a nice selection of other produce and fall plants, as well as apples, pick-your-own flowers, and fresh cider. Admission to the fall market is free. Enjoy fall activities at the Burnside barnyard where kids can meet the animal residents of the farm, admission to this area is $4. Included in the price is also a moonbounce, Jump Pad, giant inflatable slide, kids’ playset, “corn box” (sandbox filled with corn instead), games and more! Open 9am—5:30pm Mon. through Fri. 9am—3pm on Sat. Family owned and operated for 50 years! A variety of fruits and vegetables all year round, pick your own pumpkin patch is buy one get one free. Also have many varieties of PYO apples and other fall decorations. This orchard grows lots of different u-pick fruits and vegetables year-round, including: a large variety of apples, peaches, blackberries, plums, gooseberries, pears, sweet/sour cherries, pumpkins, gourds, a variety of herbs, and other seasonal vegetables. Pay only for what you pick or buy at the farm stand, never parking or admission! The farm stand carries pre-picked fruits and veggies as well as Christmas wreaths in the winter. A “REAL” pumpkin patch, so if you’re looking for lots of farm activities for kids this may not be the place to go to. However, admission is always free, the scenic hayride through two counties is always free, and pumpkins are just $.50/lb! Tons of attractions and games for the whole family and lots of pick-your-own opportunities! Take a wagon ride out to the field to pick apples from their orchard, for $1.99/lb. Fresh green veggies are also available to pick, as well as pumpkins of course! Visit during the Fall Harvest Festival if you want to get the full fall experience, complete with entertainment, food, and cider! This pick-your-own farm hosts Fall Festival Weekends, running Sept 9—Oct. 29, 10am—6pm on Saturday and 12pm—6pm on Sunday. Admission is $10 and includes hayrides, entertainment, a corn maze, pig races, corn hole, pumpkin bowling, kids’ activities, and farm animals. Get some kettle corn made fresh, hot apple cider, or a caramel apple dipped right in front of you! Fresh pies and raw honey for sale, and plenty of pumpkin and tomato picking! Pick your own apples and pumpkins this fall! Orchard honey, apple cider, and apple butter also available to purchase. This orchard is really known for their apples, but throughout the year you can also enjoy picking cherries, peaches, pumpkins, and blueberries. 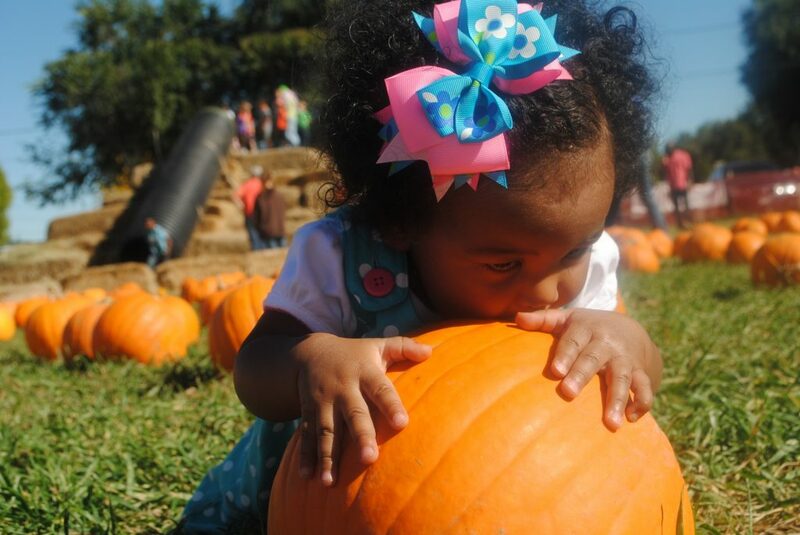 The Pumpkin Patch at Hill High Farm offers lots of family fun, for free! The largest corn maze in the area, hayrides, a haunted house, petting zoo, straw maze, and play area await you! Visit The Packing Shed for a wide variety of items, including pumpkins, mums, apples, homemade desserts, and more. This family-owned farm has lots of fun events like farm dinners, harvest festivals, and cooking classes; so you’ll want to check out their website to see what’s coming up! But if you’re looking to pick your own then pawpaws, apples, cucumbers, squash, eggplant, peppers, green beans, zucchini, beets, greens, herbs, sweet cherries, tomatillos, and tomatoes are in season. You can also buy pre-picked produce from their market, or grab a bite to eat from their surprisingly substantial “Lunch at the Farm” menu. Pick-Your-Own from 12 varieties of apples, pumpkins, and winter squash! The farm also has a large playground, wagon rides, and a “cow train” for kids to ride in. In the farm market find jams and jellies, apple butter, local honey, and other artisan products as well as cider and wines from the Peaks of Otter Winery. Find a variety of baked goods made fresh daily in the farm bakery, including apple cider donuts and pies! If that’s not enough for you their new “Sweet Shop” also carries 12 varieties of fresh-made fudge and 8 different flavors of hand-dipped ice cream! Keep an eye out for these upcoming festivals: Apple Harvest Festival (October 7 + 8), Pumpkin Festival (October 28), and Bakery Festival (November 11). Messick’s Farm Market’s Fall Festival runs from Sept 23—Oct 31, admission is $10/person on the weekends and $8 during the week. Season passes are also available so that your family can enjoy their corn maze, petting zoo, face painting, hayrides, fun slides, jump pillow, rock painting and more all season long! Their pumpkin patch features over 30 varieties of pumpkins and gourds available to pick, as well as tomatoes and other seasonal offerings. Participate in the Apple Festival on October 14th for live entertainment, food, and fun! Buy wine, honey, fresh produce, farm-raised beef, handcrafted pottery, or other local Virginia products in their farm store. Pick your own pumpkins or flowers, and say hello to the farm animals! You can also order a farm-to-crust pizza for lunch (for there or to-go), with toppings fresh off the farm! Rinker Orchards is a third-generation farm that has been hosting pick-your-own apples for 45 years! They specialize in apple growing, varieties available for you to pick include: Red Delicious, Golden Delicious, Ida Red, Nittany, York, Rome, Granny Smith, Fuji, Honey Crisp, Gala, and Redcort. During the fall you can also find apple butter, corn stalks, pumpkins, and “Rinker’s Famous Apple Cider”. Pick apples at Stribling Orchard! Varieties include Gala, McIntosh, Cortland, Red Delicious, Golden Delicious, Grimes Golden, Jonathan, Rambo, and Pippin. Fresh pressed cider and pumpkins also available! Peaches are available to pick as well during the spring, and their bakery is open on weekends. Admission to the farm (weekdays $10.95, weekends $16.95) includes a hayride, one pedal cart ride, slide hills, two huge bouncy pillows, panda bamboo maze, willow maze, “Noah’s Ark”, Tot Land, tire play, swings, and more! During their fall festival a petting zoo, the state’s largest swinging bridge, and marshmallow roasting are also included. Enjoy some hot apple cider or funnel cake while picking your family’s pumpkins and gourds in the field. Visit to pick from a variety of apples, pears, and pumpkins! Ask about their selection of other garden vegetables and free-range eggs when you visit. Have fun walking around the historic farm property, then visit again in the summer when you can pick peaches, cherries, blueberries, and blackberries! Have your pick of over 50 varieties of pumpkins at Wegmeyer Farms! Pluck them right off the vine at all three farm locations, the original historic farmstead in Hamilton, Wegmeyer at Oatlands Plantation in Leesburg (20850 Oatlands Plantation Ln. ), or Wegmeyer at Gilbert’s Corner in Aldie (at the intersection of Route 15 and Route 50). The farm also hosts Wayside Farm Fun in Berryville with a huge corn maze, hay rides, and plenty of fall activities! The festival opens on Sept. 23rd this year and the theme is Pokemon, for more info: www.waysidefarmfun.com.